There are many different styles of sports bras available, and they fall into two main categories, encapsulation and compression, with some designs offering a combination of both. In larger cups, most styles tend to be encapsulation or a combination of encapsulation and compression. An encapsulation style supports the bust by holding each breast separately. The support within the bra will lift your breasts up and away from your body and will have full coverage to reduce bounce and side to side movement. A superior encapsulation style will have underwires to keep the breasts physically in separate cups. The shape this bra gives will be more similar to your everyday bra because of the separation. Many of the non-wired sports bras in larger cup sizes are designed to encapsulate the breasts with internal structures and seams to separate the breasts. 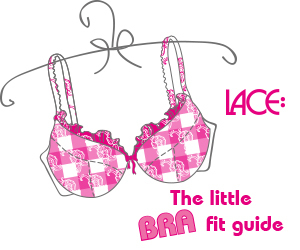 Some women find that the non-wired bras do not give enough separation or definition to the breast and that the bra rather looks like it is compressing, rather than lifting and separating. All sports bra styles stocked at LACE have elements of encapsulation, although some styles are more compressing than others. Some women will have strong preferences for one type of style over another, so certainly try a variety to see which you prefer. It may be shape, comfort or level of support based on your figure and preference. It's important when trying on a sports bra to mimic the movements you would do in your sports activities to make sure it provides enough support, straps stay in place and do not rub or chafe, and that you are comfortable with or without the wires. Compression style sports bras are designed to hold your breasts back tightly against your body. This type of style will not separate your bust, and its function is to flatten your breasts against your body for support. The idea is that with the breasts bound tightly against the chest, there will be less movement. Often, compression styles have no underwires, depth in the cup or even cups for that matter. You may also find that many compression sports bras are unavailable in bra sizes, instead offered in S–M–L sizing, which makes them difficult to fit for large cup sizes.